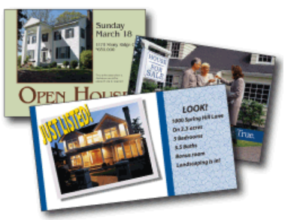 Direct mail is a proven and effective direct marketing method, especially when being used for real estate marketing. Finding potential home buyers and/or sellers and reaching out to them with direct mail isn’t hard and it’s very cost effective. Considering the price of a mailing list, postcards and stamp versus the profit made with a sale, it’s well worth the investment. Direct mail marketing works really well with real estate because of the ability to target your market. Not only can you target geography, selecting certain neighborhoods, but mailing lists can target people in the market to buy or sell their homes. You can further refine your mailing list by adding income or dwelling type to the mailing list. While a simple consumer mailing list of homeowners targeted by geography is the easiest and cheapest option, the more refined your mailing list is, the more effective it will be. Try targeting various housing situations such as homeowners vs. renter, or different financial situations, like foreclosure/default. Direct mail can be particularly successful for homeowners facing default, as they’re under a lot of pressure to make a decision to avoid foreclosure or bankruptcy. Direct mail marketing is a way of easily communicating various options to people facing default. Receiving a postcard from a realtor or investor can show them that there are, in fact, other ways to solve their problems. You can make your direct mail more personal by using short, hand-written letters. This will make your prospect feel special and individual, resulting in increased engagement. In today’s digital age, people simply don’t receive hand-written letters very often and they will usually grab someone’s attention right away. Including color pictures of your properties is a must and is a great way to make your mailing piece stand out from the rest of the mail. Depending on the size of your mailing list, you can also use to the pictures to personalize your mailing piece to various marketing segments. For instance, you can vary the photos of the homes on your direct mailings based on zip codes, so people see which homes are for sale in their area. Don’t forget to use customer testimonials. If you provide a quote from a satisfied home-buyer along with an image of the house they purchased, it will really help tie everything together for the prospect in terms of how you might help them succeed as well. In addition to reaching motivated home buyers or sellers, direct mail also increases the reach of your brand. If someone who’s not in the market receives a piece of mail, they may pass it on to a neighbor, friend, or family member. No matter what form of marketing you’re using, it’s always smart to measure its success and quantify your return on investment by including a call to action. The easiest call to action you can provide your prospect is your phone number. You’ll know your mail piece did its job if you get a phone call from a prospective home buyer or seller. Your direct mail piece could also include information about signing up for your newsletter or following you on social media, which will allow you to track the digital activity driven by your direct mail piece. Repetition is key with direct marketing. It will typically take a few mailings before your prospects are willing to engage with you, so keep working your mailing list creating slightly different messaging for each mail campaign.